Michael is an associate with Lind, Jensen, Sullivan & Peterson, P.A., where he represents clients in a wide range of litigation matters in both state and federal court. Prior to joining the firm, Michael clerked for the Honorable Lezlie O. Marek of Ramsey County District Court and served as a judicial extern to Federal Magistrate Judge Steven E. Rau. During law school, Michael was a managing editor of the Minnesota Journal of Law, Science & Technology and a research assistant for a professor. Michael graduated from the University of Minnesota Law School in 2015 and received his B.A. with distinction from the University of Minnesota in 2012. 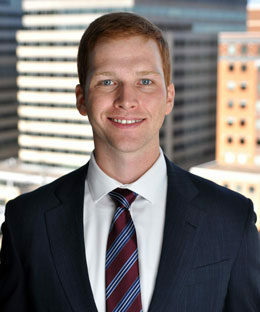 Michael takes pride in his work and enjoys guiding clients throughout the litigation process and advising them on the steps necessary to avoid potential disputes. Pandora’s Inbox: NLRB Changes Email Rules, BENCH & BAR MINN. (Mar. 10, 2015), http://mnbenchbar.com/2015/03/pandoras-inbox/.